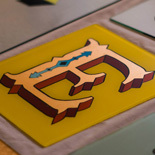 Josh Luke is a traditional sign painter who specializing in surface gilding and reverse glass gilding. Sign painting reached its zenith as a viable trade in the mid-20th century. 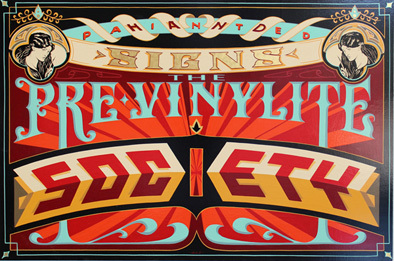 With the advent of vinyl technology in the 1980s, traditional sign painting began its decline into near oblivion. There are few practitioners around today who have been trained through a proper apprenticeship system. 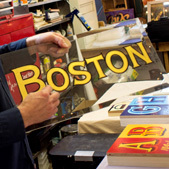 Luke learned this occupational trade under an apprenticeship with Tara Auerbach at New Bohemia Signs, one of the most well-known sign painting shops in the country. Corinna D'Schoto, is a recent graduate from Mass College of Art in painting and sculpting. She has always found old signs that have become "ghosted" to be fascinating reminders of place-based history. She and Josh believe strongly in the keeping the human touch alive and well in our public spaces. 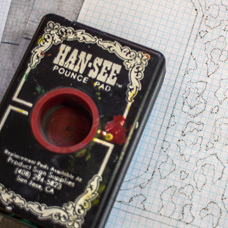 She met Josh Luke in 2013 while he was in the process of painting a mural in Jamaica Plain. She began an informal apprenticeship by working alongside him on site and later helping out in his studio. She comes to the apprenticeship having learned how to manipulate and yield the lettering brush, a couple of basic letterforms, basic layout principles, tools, and tool maintenance, and gold and precious metal gilding for surfaces and glass. Their apprenticeship will focus on mastering the various techniques of sign painting and gold leaf, including preparing surfaces, making patterns, handling the lettering quill, and gold leafing on a variety of surfaces. Mentoring will take place both in the Best Dressed Signs studio in Dorchester and during on-site jobs.